Gemini Remote Access to CFHT ESPaDOnS Spectrograph (GRACES) is the result of a cooperation between the Canada-France-Hawaii Telescope (CFHT), Gemini, and NRC-Herzberg (Canada). It combines the large collecting area of the Gemini North telescope with the high resolving power and high efficiency of the ESPaDOnS spectrograph at CFHT, to deliver high resolution spectroscopy across the optical region. This is achieved through a 270 m fiber optics feed from the Gemini North telescope to ESPaDOnS. The on-sky size of the fiber is 1.2 arcsec. GRACES achieves a maximum resolution power of R ~ 66,000 between 400 and 1,000 nm, with throughput redward of 600 nm comparable to those of currently available high-resolution spectrographs in 8-10 m class telescopes. The Gemini Multi-Object Spectrograph (GMOS-N) holds the fiber injector on the Gemini side, and is used for acquiring targets. The GMOS-N On-Instrument Wave Front Sensor (OIWFS) is used for guiding, but the Peripheral WFSs could also be chosen under certain circumstances. On the other end of the fiber, GRACES uses its own slicer bench inside of ESPaDOnS before the light is sent inside the CFHT's echelle spectrograph. For more information about ESPaDOnS, please visit this page at CFHT. The Instrument Scientist for GRACES is Kristin Chiboucas. Gemini staff who also support GRACES include Siyi Xu, Jason Chu, and André-Nicolas Chené. The CFHT contact for GRACES is Nadine Manset. Check GRACES availability in the Call for Proposals here. GRACES is offered as a "Visitor Instrument". This means it is scheduled in ~10 night blocks, two to three times a semester. For more details, see GRACES Status and Availability. We have two versions of the ITC. The webform is based on GRACES phase I results and is outdated. In its current status, GRACES has significantly higher sensitivity (expected improvement of ~20 % in the red part of the spectrum). The webform therefore represents a very conservative estimate of the present performance. We recommend using the more up to date IDL version. See also the Sensitivity and overheads page. For details on how to set up your PhII, see PhaseII OT details. Jul 21, 2015: First science observations publically available. A series of science targets were obseved to test GRACES on-sky before the 2015B semester. The data can be downloaded HERE (with associate calibration frames). The GRACES pages are organized as follows. Status and Availability: Time windows when GRACES will be available in the semester. Spectroscopy: Characteristics of GRACES modes, camera configurations, filters, and guidelines on how best to use the instrument. Polarimetry: This mode is not available at the moment, but may become possible in the future. Exposure time estimation and Overheads: Integration time estimation and details of observing overheads. Throughput and sensitivity: Throughput and sensitivity tables. Guiding Options: Guiding considerations, and wavefront sensors available for use with GRACES. Calibration: Info on GCAL flats and arcs, standard stars, and baseline calibrations. Observation Preparation: How to configure GRACES in the Observing Tool. Data Format and Reduction: Examples of GRACES data and links to data reduction resources. Basic design: Overall design of GRACES, including the slicer bench sitting inside the ESPaDOnS spectrograph, the fiber injectors inside GMOS and the path of the optical fibers. Documents: GRACES optical layout; design documents and references. 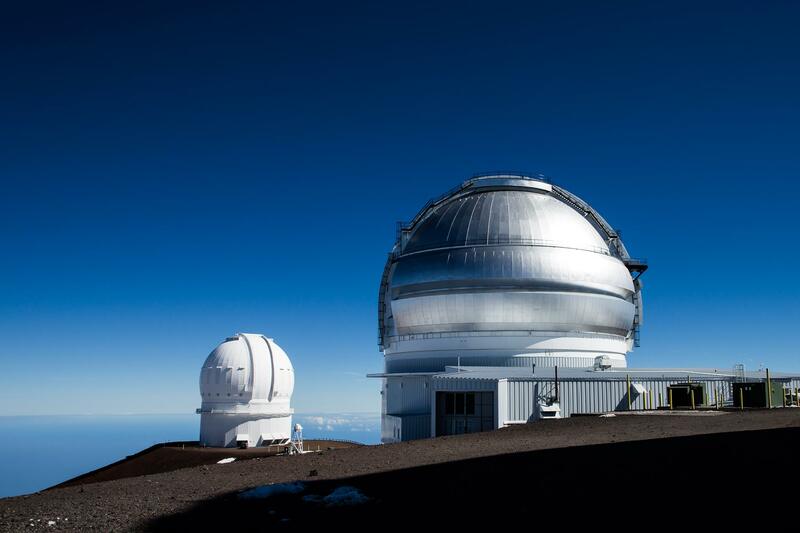 CFHT and Gemini domes next to each other on the Mauna Kea summit (credits Joy Pollard, Gemini/Aura).